Media Genesis and The Detroit Symphony Orchestra (DSO) have enjoyed a long standing relationship since 2007. 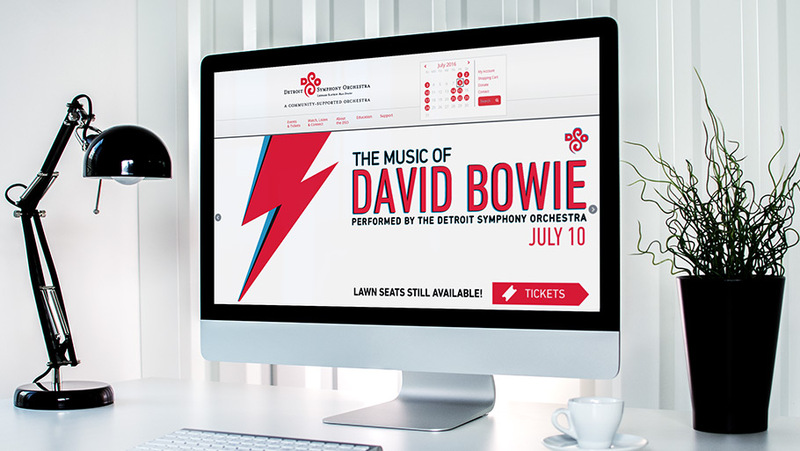 Recognized as the most accessible orchestra on the planet, MG is proud to partner with the DSO in the continual evolution of the design and technology of its site. In 2014, Media Genesis implemented a cutting-edge design within the custom .net content management system we previously built, that featured three different login views for each DSO member group, sticky navigation, enhanced calendar functionality, and responsive, full-width imagery. In 2015 Media Genesis was integral to the launch of DSO Replay, the orchestra’s video library of over 100, full-length performance videos. This premiere offering is a donation based benefit requiring user login, behind-the-scenes integration of multiple platforms, verification of donor constituency status and a unique preview feature to demonstrate the value to potential donors. 2015 also included updating the DSO’s web presence with a responsive, mobile environment featuring custom, hamburger navigation and specific treatment of the performance calendar to facilitate easy mobile browsing. In 2016 MG worked with the DSO to create a new and dynamic donation form to transfer the collection of donations from a third party to directly within the DSO organization. With more updates in the works, MG is excited to continue its successful and long time relationship with a Detroit cultural phenomenon, the Detroit Symphony Orchestra.